How many instruments can I play? Thought I’d share a little bit about the instruments that I play, and my journey on them. The violin is my main instrument, and I’ve been learning it since I was seven. I’ve played in various orchestras over the time, played on stage with a band or two, and had a whole heap of fun doing it. The violin opened up the world of music for me, but it will always be my first love. When I went to Uni, there were very few string players. There were only a couple of viola players. So, in order to help out with chamber music groupings, I taught myself the viola. 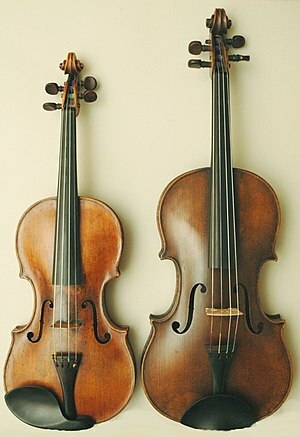 I used my spare violin and converted it to a viola, learned how to read the alto clef, and started playing the viola. I didn’t play it for long, but I still count it as an instrument I can play. My parents have a piano at their place, and over time I taught myself how to play it. I’m not great – and play the piano much in the same style as the guitar – I play the chords more than the melody line. However, I have taught myself to play a couple of easy pieces, so I’m not as bad as I was. I really enjoy playing the piano, but not having one at my place means I don’t get to play as often as I used to. A couple of years ago, I decided that I wanted to learn the guitar. So I bought one and an instructional book, and spent a couple of days learning chords and how to play. Within a couple of weeks I was playing at church in the worship team. I love the guitar now, and probably play it more than my violin these days, but that doesn’t mean I still don’t love my violin – I just love both. I can play a few other instruments, such as drums, ukulele, mandolin and recorder. I like having a go at various instruments, so there might be other instruments that get added to this list over time.